Hi everyone! 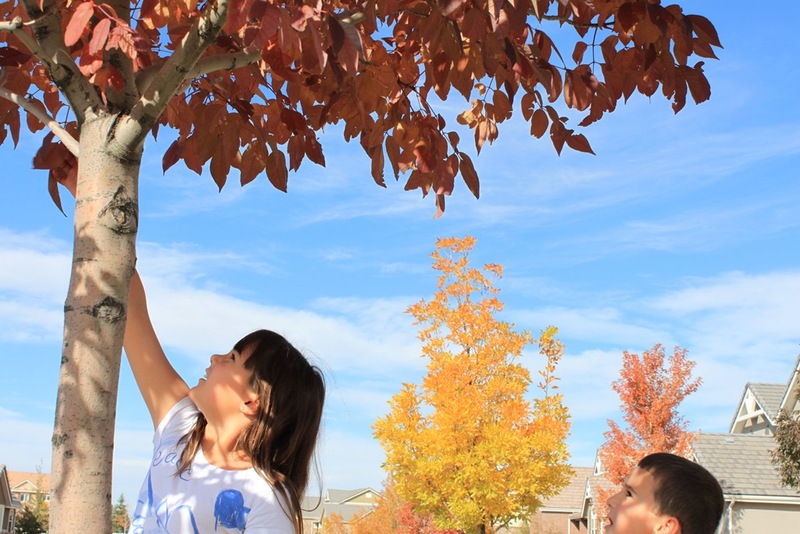 As you know, we love doing leaf crafts around here, especially in the fall when colors are so vibrant! 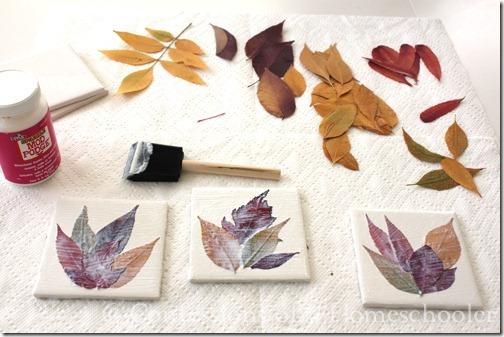 So today, I have another fun leaf craft for kids that is super easy and cheap! So let’s see what all we need shall we? 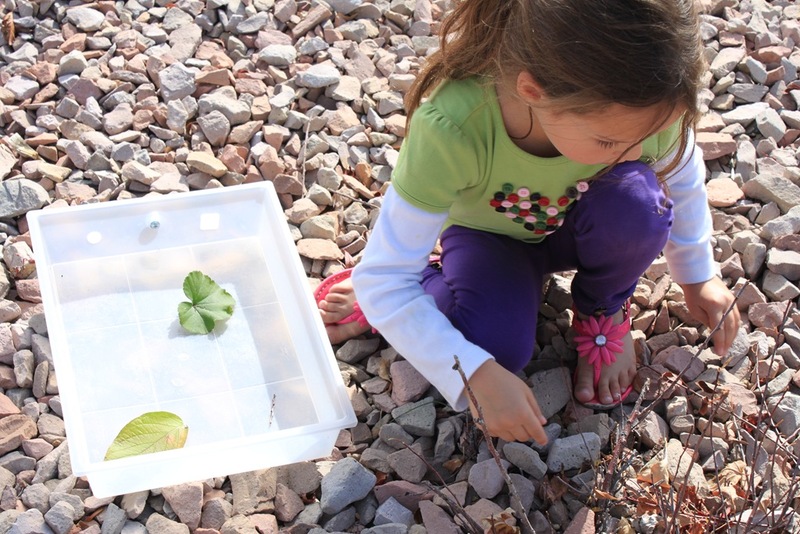 The first step, and quite possibly the most fun one, is to send the troops out to gather a variety of leaves. 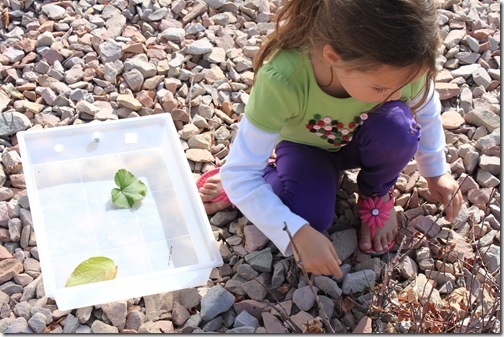 I usually encourage them to try and find ones that are very colorful, as well as some that are more unusual in shape for variety. Okay, now that you’ve collected a variety of leaves, time to bring them in and spread them around your table to see what you’ve got. Place a few leaves in between the pages of your book, then skip a few pages and place some more and so on until all of your leaves are in the book. Next place your book in a safe place and add something else on top of the book for added weight. I used a case of water bottles. Leave your book setting for about 7-10 days. 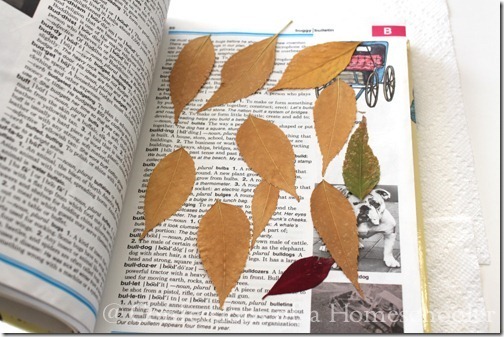 Finally open your book and check the leaves. 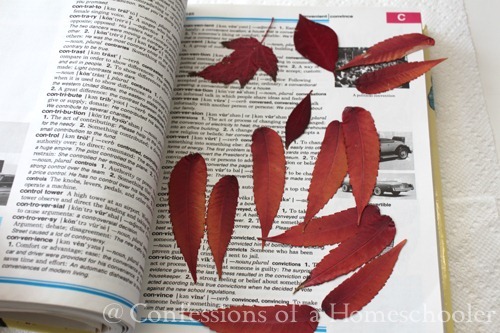 You’ll want to make sure they are nice and flat as well as dry. 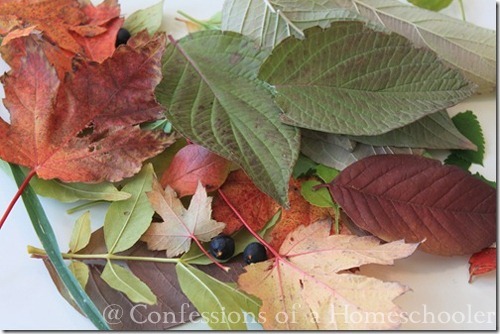 Carefully remove your leaves and spread them on the table so you can again see your collection. The next step is to prepare your tile. 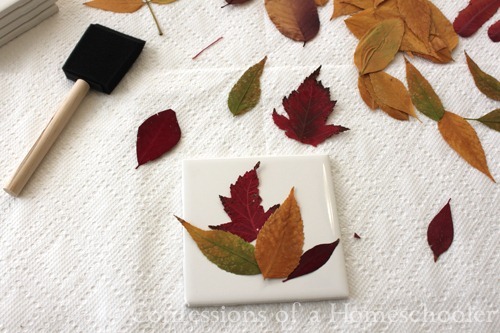 Have your students select a few leaves that they would like to use and set them out on their clean tile so they can see how the leaves will be arranged. 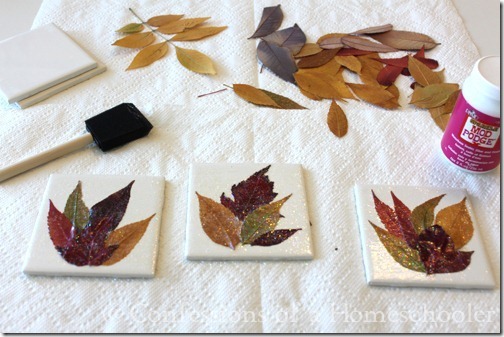 Once they have their arrangement all set, remove the leaves and paint a thin layer of Mod Podge over the clean tile. 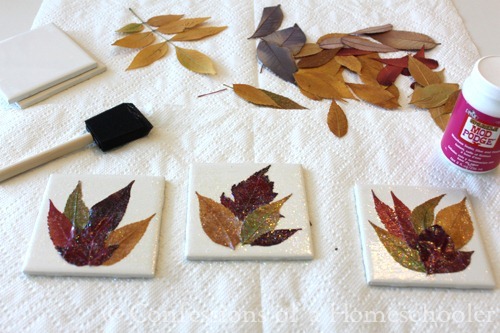 While the tile is still wet from the first coat of Mod Podge, add your first leaf, it should be the bottom layer in your arrangement, and place a think layer of Mod Podge over that leaf. Add the next leaf and a layer of Mod Podge over that one, and so on, until all of the leaves are arranged onto your tile. 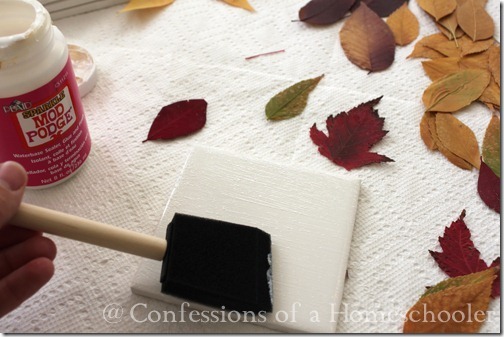 Allow this layer to dry completely. Once all of the tiles are completed and the layers of Mod Podge are dried, add one final coat of Mod Podge over your coaster and let dry. You’ll be able to tell that th etiles are dry by touch, but you’ll also notice that they are not milky looking anymore, but instead will have a nice clear shine to them. We used a glitter Mod Podge for ours, but I don’t think I like the glitter look with the leaves, so for this craft I would suggest a clear glossy Mod Podge. 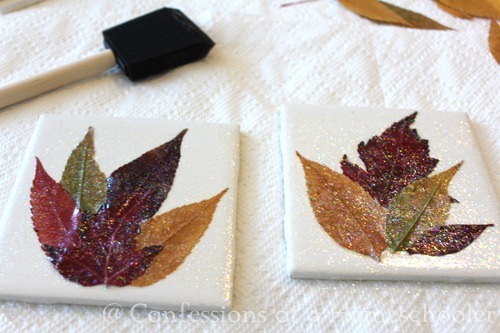 Although I do think the glitter one would be great for use on Christmas coasters! One final step once the coasters are dry is to add some felt to the bottoms so they don’t scratch your tables. You can either purchase small sticky backed felt circles, or cut a square of felt and simply glue it to the bottoms. And here are our completed coasters! These are great for gifts, or simply an addition to your own home. 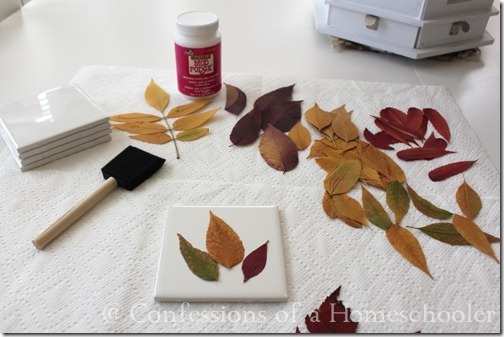 An alternative to the coaster idea is to use glass mason jars instead of tiles. Using the same exact technique add the leaves to the outside of jar with the Mod Podge. Once completed add a candle to the jar and then enjoy the beautifully lit leaves as they add a nice glow to your evening! Make sure to leave a comment below if you try this at home. I’d love to see pictures of what you all come up with! What a cute idea! Can’t wait to try this out. I love this idea. I’m going to use this as a project for my preschool class. Very cute, Erica. Can you actually put a hot beverage on them or does it melt the Modge Podge glue? I’m imagining that cold beverages would be the best. What’s your experience? 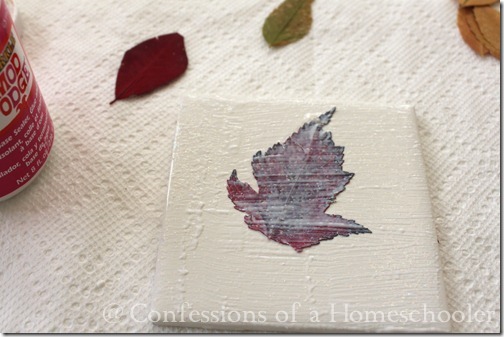 I made some coasters using tiles, photos I printed at walgreens, and mod podge. I did spray them w/ a clear acrylic sealer as well, but we use them for all beverages – hot and cold. They still look great 4 years later! 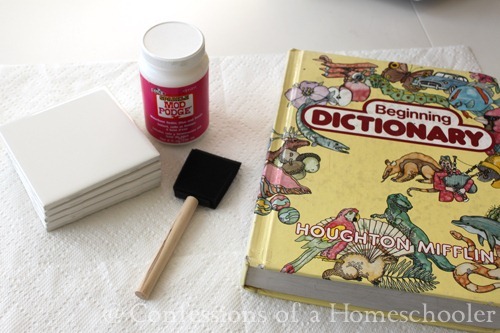 Where did you purchase the clear acrylic sealer? 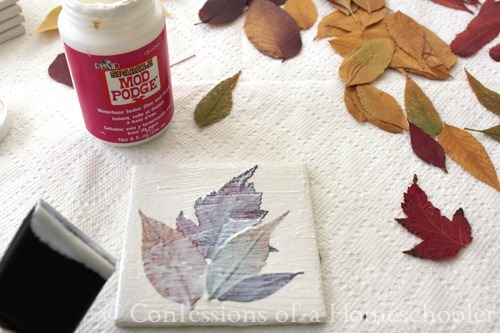 When I type that in Google, it shows Mod Podge. The only question I have is: when they have a glass on them and the glass gets damp, will the Mod Podge get sticky again? If so a clear acrylic will eliminate the problem. You can spray them with clear acrylic sealer, but no we haven’t had any troubles with them getting sticky again. I love this idea! Thanks for sharing it. Can’t wait to try it out. 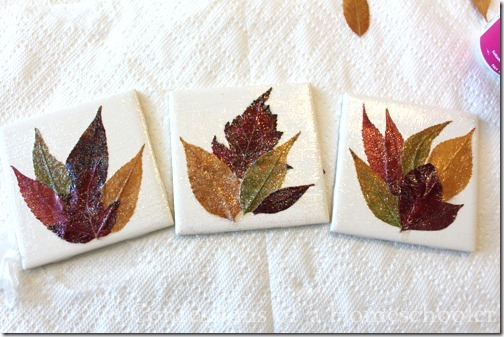 I have several plain glass coasters from glasscoaster,com do you think I can design them with leaves like what you did with the bathroom tile? So cute! We’ve added scrap book paper to tiles before but never leaves. This is going on our to do list! Thanks for sharing. I cant wait to do this. Thanks for having explicit directions. I have to have a visual!! I have made the candle holders and they are great. 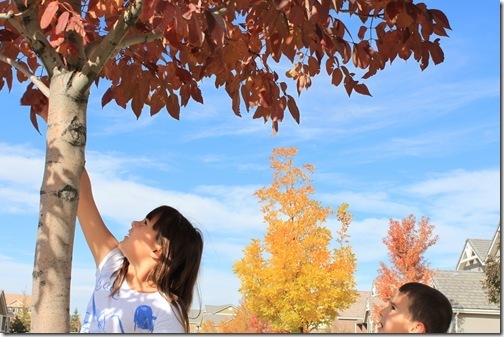 The best part of it was gathering the leaves with my 3 year old. When it was finished I have had several people ask for them. I will have to try the coasters.